If we consider what are the grounds of a mobile, it is clear that this was designed to make calls and send messages on the move, although it seems that the emergence of smartphones and app stores has darkened slightly basic aspects of these devices. Although there are applications that, besides being the most successful are those that let you communicate at all times to its users, with the messaging and VOIP calls as WhatsApp , Viber or Skype the real winners. Although they only allow you to communicate to users who have their own facility on your phone, having to jump through hoops of the mobile operator when calling plays an address, company or person without a smartphone, at least until before using telephony and Forfone messaging offers us. With an air similar to other services such as fonYou , Forfone includes a free communication service when it comes to sending messages or call users who have also the application and can use their own phone service with a cheaper cost and free calls all local premium numbers. This is already big words, everything a mobile operator within a single application. Forfone proposes a complete communication solution, both among registered users with the application and any other mobile phone. Nothing to install, this will prompt you to enter our phone number, arrived later a confirmation SMS with the code to activate Forfone and start making calls. And this is as simple as dialing through its integrated keypad, find the contact in our agenda, showing if we take the call or SMS at no cost, and an option to return the incoming calls made ​​or lost. Like the native phone application, except that we take the call in case Forfone to contact us through this system. We may also use the headset or communications, with an option to send pictures with messages. And if they are always free within these options: the other user has Forfone application or call a local number. For the remaining numbers will have to buy Forfone balance, with prices starting from 0.9 cents per SMS. Forfone is a comprehensive communication solution which, as usual with this type of application, we will take more out if our friends also have it on your smartphone. Also, if you get invite, you will Forfone Balance 0.50 cents each, which certainly is a double incentive to attract calls and messaging platform. Android To download Forfone just have to follow the link below, being a free app. 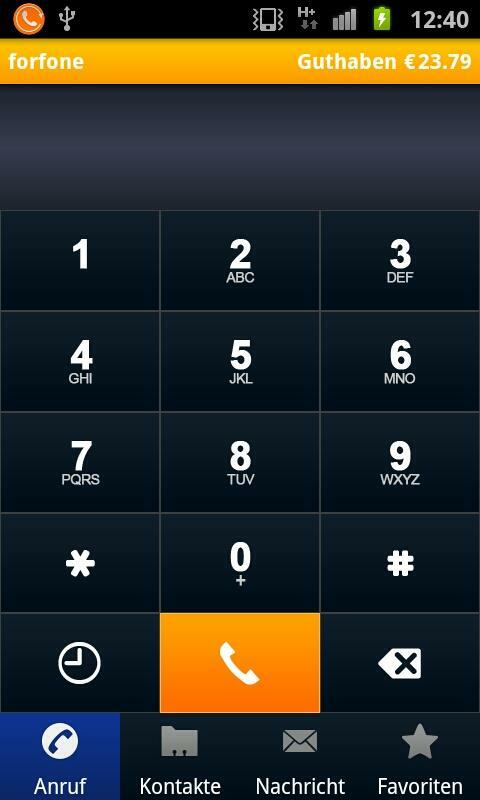 forfone is an app that provides FREE WORLDWIDE CALLS , TEXT & PICTURE MESSAGES. Merely obtain the app and begin free around the world phoning, text and picture messages with other forfone people without signing up. From as low as 1.9 Dollar you can also develop around the world phoning to acquaintances who do not use forfone. NO ROAMING COSTS when phoning from overseas. When you are overseas with your android os system you can telephone people, deliver text and picture messages without any roaming costs. Merely use a wireless system. * 100% FREE CALLS: all forfone solutions have the freedom, there is no primary fee and no disguised. costs. No cost around the world phoning, free around the world text and picture messages to all forfone people. All acquaintances in your yellow pages will immediately have a ‘forfree’ transmission as soon as they have hooked up the forfone app. Explain to your associates now and let them know that they can develop FREE PHONE CALLS. All they need is an online access (3G or Wifi). * MAKE CALLS TO NON FORFONE CONTACTS. forfone features the support to telephone and text non forfone people. From as low as 1.9 Dollar you can develop worldwide phoning. All charges for worldwide phoning outside the forfone system can be discovered on our internet site. *NO REGISTRATION, USERNAME OR PASSWORD. Merely obtain and begin the app. You will then obtain a word for acceptance. There is no username or password that you have to get into. Merely begin to make free phoning. * NO BUDDY LIST: forfone immediately indicates all acquaintances that have the forfone app hooked up as ‚free’. As opposed to as with Skype, House windows Stay Messenger or Fring you do not have to know an excess username. * VOICE QUALITY: forfone is using the latest technologies as a way to offer best possible voice quality. Please keep in mind that the voice quality will depend on your web access. Best quality is arrived at with 3G or a entire Wi-fi compatability transmission. There are already so many VoIP based applications and soft phones in the market. I don't think we need to re-invent the wheel daily. Already companies like Axvoice, Vonage and packet 8 are offering soft phones that perform much better than the soft phones available in the market.